A.O. Smith Z7+ Hot Water Purifier Review: A. O. Smith Corporation is an American manufacturer of both residential and commercial water heaters and boilers and it is the largest manufacturer of water heaters in North America. The company has 24 locations worldwide and have recently set their footprint in India with the launch of water purifiers and water heaters. Having reviewed over 50 water purifier models across different brands in India, I’ve got my hands on the A. O. Smith Z7+ Hot water purifier and it is very similar to the A. O. Smith Z6+ Hot water purifier that we’ve reviewed yesterday. Let’s see on how they differ from each other. A.O. Smith Z6+ Hot vs A. O. Smith Z7+ Hot water purifier: While both follow a 7 step water purification process and share the same filters, their features and physical appearance are different. Z7+ Hot has one touch water dispensing feature and does not have a knob to turn on water manually, on the other hand, Z6+ Hot doesn’t have one touch water dispensing, but follows a traditional water faucet to dispense water. If you live in a city with frequent power cuts and don’t have a power back up at home, A. O. Smith Z7+ Hot cannot dispense water without electricity. Build: A.O. Smith Z7+ Hot is made with food grade, non-toxic, engineering grade plastics. Such plastic is considered nontoxic and BPA free, this keeps the water bacteria free even when stored for longer duration. The water purifier is flexible to be installed on a table top or wall mounted and it does not eat up the kitchen real estate, thanks to its W322 x D368 x H480 (mm) dimensions that make it look really neat & compact. The body corners are neat, elegant without any sharp corners or gaps between the side panels. The large 10 liter water tank is well built and split to handle 9.2 liters of room temperature water and 0.8 liters of hot water in a stainless steel tank. Technology: A. O. Smith Z7+ Hot water purifier is equipped with an advanced 7 stage water purification process that includes Pre-filter + Sediment filter + Pre Carbon filter + Side Stream RO + MIN-TECH (Mineralizer Technology) + Silver Activated Post Carbon and SCMT (Silver Charged Membrane Technology) filter. These powerful filters can remove TDS greater than 95% and help in water recovery up to 30% without slowing down the water flow rate at 15 liters per hour. A. O. Smith Z7+ Hot water purifier is equipped with all the bells & whistles, filter change indicators and I like the child lock feature that turns on automatically when the water temperature is more than 50 degree centigrade. Mineralised hot water at the press of a button and it is useful for preparing quick cup of tea, baby food, soaking lentils, soothing a sore throat etc. Design: Hands-down, A.O. 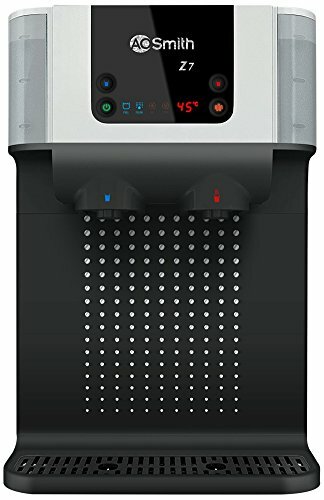 Smith Z7+ Hot Water Purifier is one of the best looking, intuitive, sleek and stylish water purifiers that can blend with any modular kitchen that you have. It is one of the few water purifiers in the market that can dispense hot water in different temperatures, 45 and 85 degree centigrade. A. O. Z7+ is brilliantly designed and intuitive to use, alarms are self explanatory on the digital screen, the night vision is handy to guide you to the water purifier with its glow factor and there are other great features and is practically to pen down all of them in this review. The one touch water dispensing option is an excellent feature that works only when the device is powered on. Service & Price: A.O Smith is headquartered in Bengaluru, Karnataka and has regional presence in Mumbai and Delhi. A.O. Smith water purifiers are sold and serviced in major cities of India and the company plans to expand its presence to other cities very soon. The pre-filters and sediment pre-carbon filters have an average lifespan of 2500 liters, MIN-TECH will last up to 6000 liters of water and the expensive RO membrane can purify between 6000 to 12000 liters of water depending on the input quality. A.O. Smith Z7+ Hot water purifier is retailing at ₹ 26,250.00 and is available online at Amazon.in from ₹ 23,000.00, customers are eligible for the same 2 year warranty and free installation when purchased online at Amazon.in. A few customers complain on the high filter replacement costs, this is inevitable with poor source water quality. A. O. Smith also offers annual maintenance contracts that cover unexpected breakdowns or to avoid high filter replacement costs. Conclusion: A.O. Smith Z7+ Hot water purifier is one of the most intuitive, feature packed, stylish water purifier with robust technology that can perfectly fit in any modular kitchen. The 7 stage water purification is best in-class that can remove over 95% TDS from water. The hassle free annual maintenance cost is a good option to protect your investment. Having an option to dispense cold water along with hot water may be a good option, but, that will not be a deal breaker. A. O. Smith Z7+ Hot water purifier is retailing at ₹ 24,500.00 and is available online at Amazon.in from ₹ 23,000.00, customers are eligible for the same 2 year warranty and free installation when purchased online at Amazon.in.